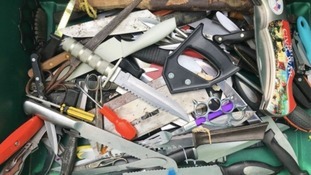 Knives, knuckle-dusters and even a sword have been handed in after Jack started collecting weapons that were being carried by young people. Four people have been found guilty of the gang-related murder of Suffolk teenager Tavis Spencer-Aitkens. A fifth verdict has been made in the Tavis Spencer-Aitkens murder trial. Callum Platts, 23, was found not guilty of murder, but was found guilty of Manslaughter. He was found guilty by a majority verdict of 10-1. Two men and a 17-year-old boy have been found guilty of the murder of Suffolk teenager Tavis Spencer-Aitkens. Adebayo Amusa, Aristote Yenge, and a 17-year-old Kyreis Davies were among six males accused of being involved in Tavis’ killing in Ipswich in June last year. Tavis, 17, was found stabbed to death at Packard Avenue, just yards from his home. Forty-two-year-old Leon Glasgow has been found not guilty of murder and manslaughter charges. The jury at Ipswich Crown Court are continuing to deliberate over two other accused - Callum Plaats and Isaac Calver.